An adoring crowd of young people, parents, community members and basketball lovers filled the auditorium at the Frederick K.C. Price III Christian Schools to greet NBA star and alumni Allen Crabbe on March 20. 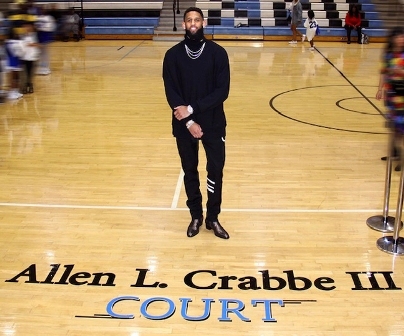 The audience gathered to ­witness the official naming of the Youth Activity Center court after Crabbe, who attended FKCP from the age of 12-weeks-old to his high school graduation. In addition, the Brooklyn Nets player donated a significant amount last year to keep the institution operating in South Los Angeles. FKCP was established in 1986 by Crabbe’s grandparents, Apostle Frederick and Dr. Betty Price, founders of Crenshaw Christian Center, and his aunt, Angela Price Evans. The fully accredited facility has maintained a 100 percent graduation rate among its students and 100 percent acceptance rate into four-year universities. Crabbe’s contribution ensures that FKCP will continue to open for years into the future. “This is a time of rejoicing. We are all here on one accord to celebrate this young man and his accomplishments. I thank you, Lord, for his dedication, his hard work and his commitment to excellence,” said Crabbe’s uncle, Pastor Fred K. Price, Jr., during his opening prayer. Offering more insight about Crabbe’s actions, Evans noted, “The back story is quite amazing. Last June 29, this hometown hero saved his alma mater on the same day I was about to give the dreaded news [of the schools’ closing] to our parents and teachers. It would have been the last Christian school open in this area. Agreeing that the impact of his donation was unexpected, Crabbe remarked that it was simply his love of God and his family that influenced him to contribute the finances. “I did this out of the goodness of my heart for God, my family and my grandparents and aunt who founded this school. The legacy that they have built over the years has been amazing,” said Crabbe. “Just knowing that the school was going to close, I didn’t have a second thought [about helping] and continuing to generate ways to keep the schools open. I just couldn’t let it close. The attendees at the ceremony included Brooklyn Nets coach Kenny Atkinson and Crabbe’s teammates, D’Angelo Russell, Shabazz Napier and Caris Levert. Frederick K.C. Price III Schools is located on the campus of Crenshaw Christian Center, 7901 S. Vermont Ave., in Los Angeles. To learn more, visit priceschools.org.